Clearance between Sprout's seat & my belly is under a half inch now! 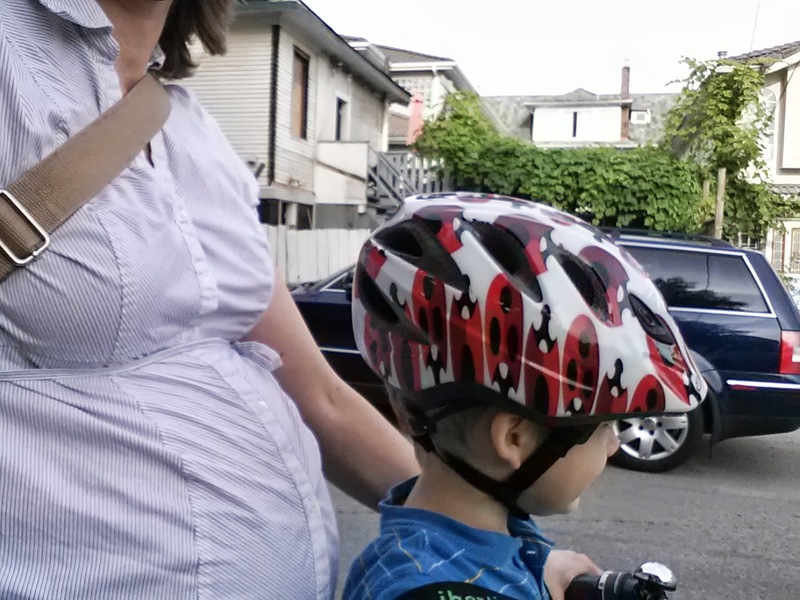 Now that I've been riding through nearly nine months of pregnancy, usually with a toddler in tow, I'd love to share what I've learned from my experience. I won't add in a bunch of safety advice--going slowly, riding more defensively, taking it easy--because you know all that. I'm sure you know this too, but I'll toss it in just in case: pregnancy isn't the time to learn to ride a bike or start riding farther than you ever have, just like it's not a time you'd begin marathon training, having never run around the block. Like with any other physical activity, cycling while pregnant is fine if you were used to doing it before. So this post is really aimed at women who already ride bikes, whether that be recreationally, for transportation or competetively. Sit up: get an upright style bike. Before you stop reading here & say that's too expensive, there's no need to buy a whole new bike. You can turn a lot of bikes into this style with a single modification: get new swept-back handlebars (cruiser bike style so you can sit with your back straight & still reach them). I bought a used set from Pedal Depot for $11, had someone else install them & put on new brake & gear cables, which cost me another $15, I think it was. Two reasons why sitting up is better when pregnant: it's more comfortable when your centre of gravity shifts to the front & it enables you to see around you better without twisting. Also: if you carry like I do, by your seventh month, your belly will get poked by the front of your seat or your knees as you pedal if you're leaning forward much. Omafiets is the way to go! Omafiets (translated literally as 'grandma bike') are the typical frame style in a lot of Scandinavia, ridden by men & women alike because they are so easy to step in & out of when wearing 'normal' clothing, including long skirts. If you can buy a new bike, go for a step-through frame. It'll make your life easier in your third trimester when lifting your leg higher than six inches becomes awkward. The classic Dutch Omafiets has a really low step through, but a mixte or 'ladies' frame will still give you some advantage to the typical diamond-shaped 'mens' frames that are standard in North America. Support that pelvis. Get yourself a really wide seat, unless you already have one. That wonderful hormone Relaxin is busy loosening up your joints in preparation for pushing a baby out, so you'll be much more comfortable on a seat that doesn't put pressure between your sitz bones. This is a pretty cheap modification to do yourself--a decent seat (new or used) won't cost you more than $30-40. If you can find a women-specific seat with an indentation or hole down the centre, that'll help make the ride a little more comfortable too, as your perineal area will likely become a bit more sensitive during pregnancy. Get down! Lower your seat a bit. It does mean you'll have less optimal pedal strokes as you're riding, but your lower back & pelvis will thank you. A lower seat makes it easier to get on & off without putting weight on your pelvis as you're still lopsided. Get to know your quick release or your multi-tool to adjust this as needed. I've been taking mine down a half inch or so every other week lately. Take a stand. 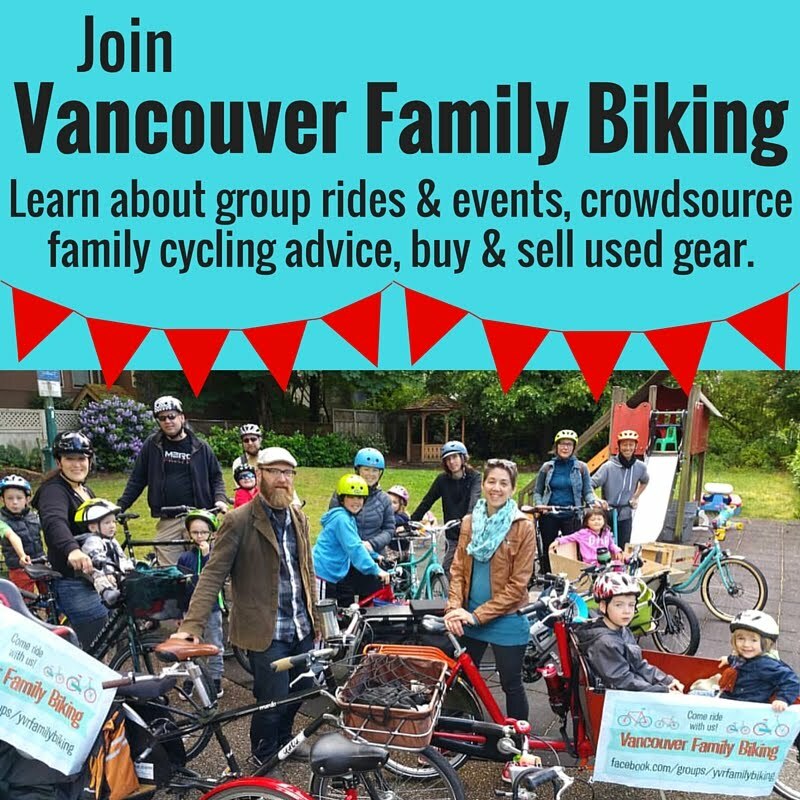 Get yourself a good kickstand (double is ideal) if you don't already have one so that you can let go of the bike while locking up, loading panniers, bags, children into seats or trailers, etc. All that stuff just gets a bit more awkward as your belly gets bigger & your endurance wanes.